Anthony van Dyck (1599-1641) painted the series Christ and the Twelve Apostles (c.1618), one of the first major projects of his early career, during his time in the studio of Peter Paul Rubens (1577-1640), possibly at Rubens's suggestion and certainly inspired by Rubens's own series of the same subject, which was painted for his patron the Duke of Lerma in 1612. Van Dyck's series, now dispersed, was successful enough to induce the artist to paint several replicas of at least some of the panels himself and to generate numerous later copies by other artists. Tracing which surviving panel relates to which set has supported a considerable body of published scholarship by itself. 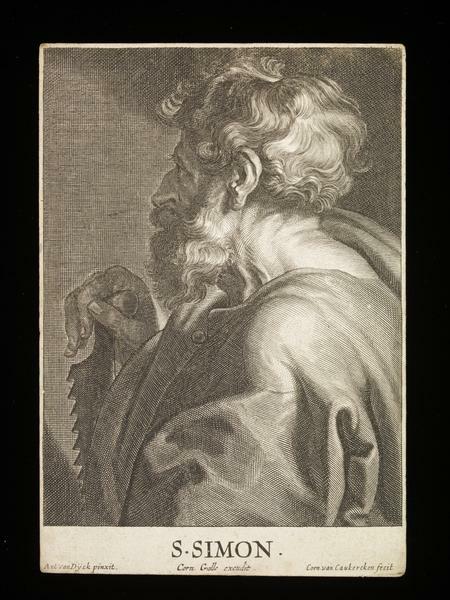 The whole series was engraved by Cornelis van Caukercken (1626-1680) for the publisher Cornelis Galle the Younger (1615-1678), with the addition of a Saint James the Less based on van Dyck's Saint James the Greater (not included in the current set). The date of the engravings is not certain but may have been after 1660 when van Caukercken first became a member of the Antwerp Guild. There has been some published discussion about this and about which set (or sets) of the paintings provided the models for the engravings. 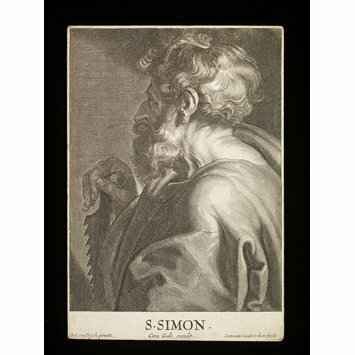 Half-length portrait of Saint Simon the Zealot holding a saw. 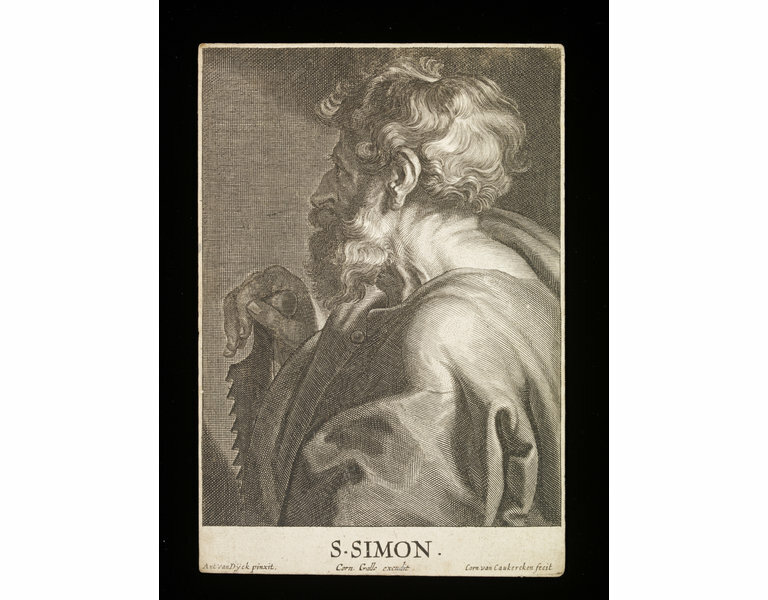 Cornelis van Caukercken after Anthony van Dyck, Saint Simon, from the series Christ and the Twelve Apostles, Flemish, 17th century, engraving.